Looking for Circuit Breaker Enclosures? Get a quote fast. Proper protection demands a proper enclosure. So you’ve got your circuit breakers, now it’s time to get your circuit breaker enclosure. But what is a circuit breaker enclosure? Essentially, it is a cabinet that will protect your circuit breakers. Because whether your breakers will be located outdoors or indoors, you need to be equipped with the proper circuit breaker enclosure to effectively protect your devices from dust, corrosion, and other outside elements that can cause damage. It’s also important to note that circuit breakers are never rated for outdoor use on their own, so choosing the right enclosure is not only crucial, but required. This means that before purchasing your circuit breaker enclosure, you must know what NEMA rating you require for your enclosure. What enclosure rating is right for me? There are a vast variety of NEMA-rated enclosures, each intended for a specific use and to protect against different elements depending on where and how your circuit breakers are installed. All will protect the user from hazardous parts inside the enclosure. The most common ratings are as follows: Type 1 circuit breaker enclosures are a basic enclosure intended for indoor use, and protect against dirt and dust. Type 3R circuit breaker enclosures are intended for indoor or outdoors use, and protect against dirt, dust, rain, sleet, and snow. Type 4 circuit breaker enclosures protect against everything outlined for type 3R, plus falling dirt, windblown dust, and splashed or directed water (from a hose, for example). Type 12 circuit breaker enclosures are intended solely for indoor use to protect against heavier, solid falling objects, as well as light splashing. We meet your enclosure specifications and exceed your expectations. Bay Power has an extensive variety of enclosures across several NEMA ratings to protect your circuit breakers from dust, rain, corrosive materials and more. We offer a wide range of enclosures in many sizes and finishes that can be fully customizable. 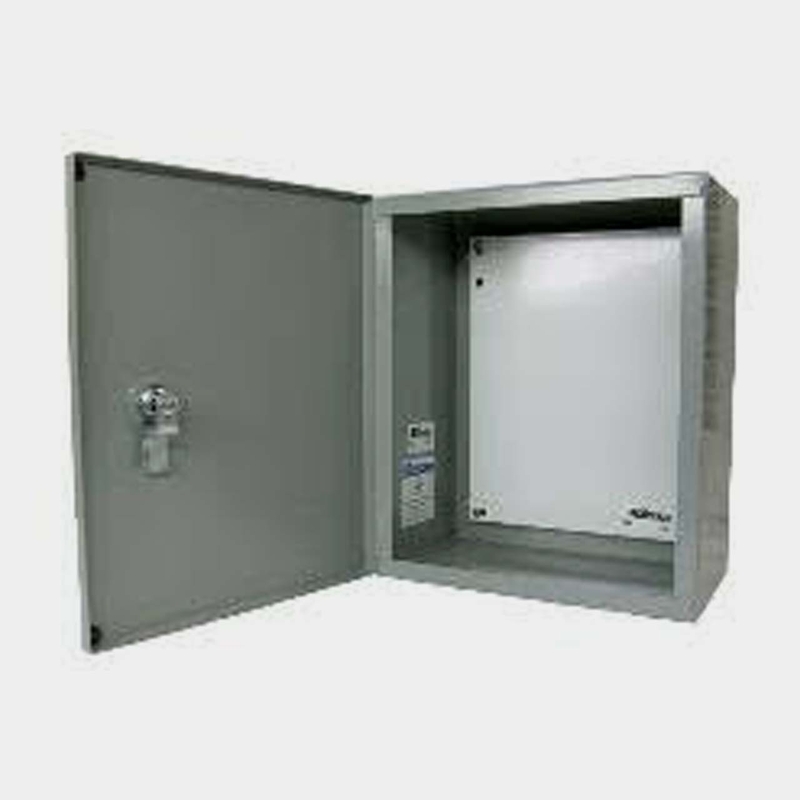 So whether you’re looking for an outdoor circuit breaker enclosure, stainless steel or otherwise, count on Bay Power for all your circuit breaker enclosure needs. Have any old or unused Circuit Breaker Enclosures lying around? Don’t get rid of them just yet. While we stock a wide range of quality electrical products and solutions, both new and reconditioned, we also buy back your unwanted equipment. So, before deciding what to do with your old Circuit Breaker Enclosures and components, have one of our expert technicians take a look to see if we can save a few parts, save the environment, and save you some cash. Great service shouldn’t end after the purchase. We pride ourselves on the relationships we build with our customer-first mentality and the quality of our Circuit Breaker Enclosures and components. That’s why we offer a 1-year replacement warranty on all of our electrical products and solutions from the top manufacturers. Because when you buy with Bay Power, you buy with confidence. We are proud to stock a variety of competitively priced, new and reconditioned components from the leading manufacturers of Circuit Breaker Enclosures. Thanks to our extensive inventory of Circuit Breaker Enclosures and components, our resourceful and expertly trained staff will always be able to get the products that you need. Through our extensive network of suppliers, we are able to carry and acquire a huge variety of electrical products and solutions, so chances are if you need it, we can get it. Bay Power’s priority is providing you with reliable, high quality electrical hardware. That’s why our mission is to make sure our reconditioned electrical products and solutions function as perfectly as the day they were built. Because while the quality is high, the cost of Circuit Breaker Enclosures shouldn’t be. Our selection of new surplus Circuit Breaker Enclosures may not arrive brand new in a box, but they function just as well, and have never had electricity run through them. All of the quality, none of the packaging, always with our 1-year replacement warranty.